You’ll find answers to many of the questions people ask us regularly in the FAQ section below — just click on the question you’re interested in to reveal the answer you’re looking for — or use the handy FAQ search facility below. If you can’t find the answer you’re looking for then by all means contact us for more information. What species am I most likely to see in West Cork? Some of the species you could see from the deck of The Holly Jo with Cork Whale Watch. West Cork waters are among the best places in Europe to see large marine wildlife. Common dolphins, as the name suggest, are West Cork’s most frequently observed cetacean. We see them on most trips during the summer, autumn and winter. They often join the Holly Jo to bow-ride, offering spectacular views of their acrobatic behaviour. We sometimes encounter large groups of common dolphins with mothers and their calves in their midst. The shy harbour porpoise , Ireland’s smallest whale, is commonly seen on our trips in West Cork, but sightings require very calm sea conditions. Bottlenose dolphins are occasional visitors to West Cork, and we do encounter small groups every year. We also occasionally see Risso’s dolphins and Atlantic white-sided dolphins from the Holly Jo. 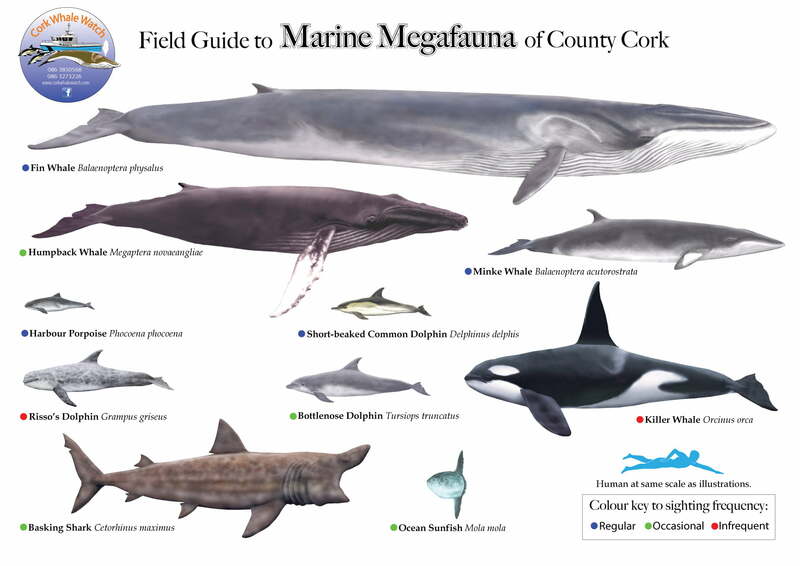 Year after year minke whales, fin whales, and humpback whales return along with several species of dolphins to feed in West Cork’s in-shore waters. Atlantic grey seals and common seals are resident on and around many of the striking uninhabited islands and a close encounter with these charismatic marine mammals is always an enjoyable aspect of every trip out with Cork Whale Watch. West Cork waters are also home to a wide range of both oceanic and coastal sea birds. Gannets, kittiwakes, various shearwater species, storm petrels, razorbills, puffins, guillemots and much more can be seen from the deck of the Holly Jo. Huge clouds of seabirds often congregate around feeding whales and dolphins. Watching a lunge-feeding fin whale engulfed in a cloud of diving gannets and wheeling kittiwakes is simply breathtaking. Colin Barnes will help you identify species, and share his extensive knowledge on the seabird ecology of the region. 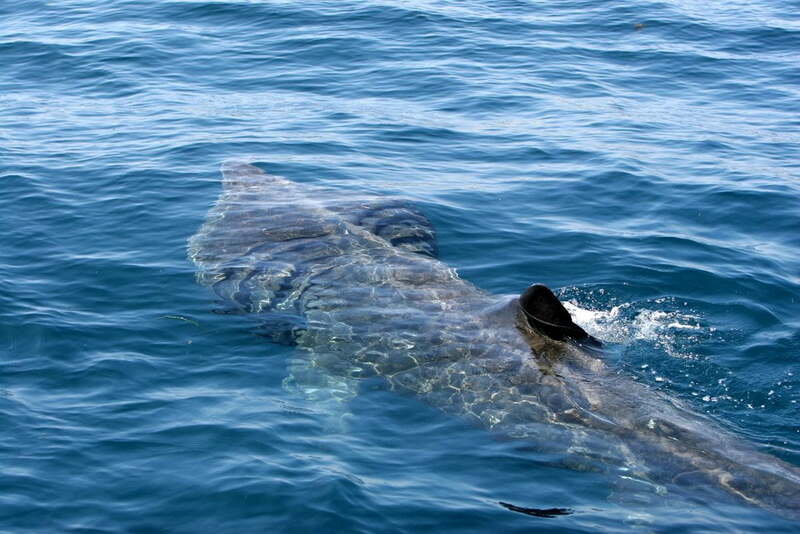 During the late spring and early summer basking sharks are annual visitors to the West Cork coast, and we sometimes see the rare leatherback turtle, sunfish, blue sharks and various jelly fish species from the decks of the Holly Jo. Do you accept bookings for larger groups? Due to the unpredictable nature of weather in the southwest of Ireland and the possibility of cancellations etc, we ask that you pay Colin directly at the end of your trip with cash. Please note we CAN NOT process credit cards or electronic payments on the boat, and so paying with cash on the day is the simplest method. We ask all groups of 6 or more people to pay a booking deposit of €150 via pay pal. Please note that you do not need to have a Paypal account to use this facility, as you are using our Paypal account. All you need is a credit card. The balance due can simply be paid on the day by cash after the trip. In the event that the trip doesn’t proceed due to poor weather, we will of course give you a full and immediate refund. The advantage of using Paypal is that it is safe, and our refunding you is a simple click of a “refund button”. Your paying us a booking deposit shows a commitment on your part to this booking. The fact that a group has paid a deposit means they are very unlikely not to show up on the day, which happens more often than we’d like when groups don’t pay a deposit. Will I always see whales on a whale watching trip? As with any wildlife watching venture, whales and dolphins can be unpredictable. We don’t offer any gimmicks such as money back guarantees, in the rare event of their being no sightings. That said, Colin’s unrivalled experience significantly increases your chance of encountering a range of cetacean species on your trip, which typically produce whale and/or dolphin sightings on about >96% of our trips (see breakdown below). Grey seals are seen on every trip on the inshore islands, as well as an array of seabirds and fantastic coastal scenery, so there is always something wonderful and new to see. Colin often produces fishing rods if things are quiet and give clients an opportunity to catch their own supper. Dolphins were recorded on 86.3% of trips (80% in 2016), almost all were common dolphin. harbour porpoise Phocoena phocoena, short-beaked common dolphin Delphinus delphis, Risso’s dolphin Grampus griseus, bottlenose dolphin Tursiops truncatus, minke whale Balaenoptera acutorostrata, humpback whale Megaptera novaeanlgliae, fin whale Balaenoptera physalus & bowhead whale Balaena mysticetus. We will generally have a very good idea of weather conditions 48-72 hours prior to your trip and so, last minute cancellations are very rare. We ask all our clients, to re-confirm bookings with us 2 days before your trip to confirm weather suitability and that you still want to join us. You should follow the daily trip updates on our Facebook page. However, if Colin considers the weather and sea conditions unsuitable or unsafe for a Whale Watch, we reserve the right to cancel any trip at any time. It is therefore essential that the contact details you give with your booking are correct at the time of sailing so that we can forewarn you of any last minute changes. Sometimes, passengers may have to cancel their trip. Please ensure that you contact us at the earliest possible moment if you find you cannot keep your booking in compliance with our 24 Hr cancellation policy. During the summer months, we’ll have others waiting on a standby list who could use your places. Any deposits will be refunded if a cancellation is received forty eight hours before scheduled trip time and if we have to cancel a trip to poor weather. Even on the finest day, as the ‘Holly Jo’ picks up speed, the breeze can be surprisingly chilling. Please ensure you bring a windproof/waterproof jacket for protection. During warm weather we suggest people apply sun block before heading out and bring a broad hat with a generous rim, as the sun and wind can take a toll on pale Celtic skin! Although tea and coffee can be made in the wheelhouse, this is a low priority for us when searching for whales. So we suggest you bring along a hot flask of your favourite brew and any snacks or a picnic as fresh sea air can make you very peckish. More importantly being on the water for 4-5 hrs can leave you quite dehydrated, so we suggest you bring fluids or a flask of tea/soup etc.! Don’t forget to bring your camera, spare batteries and a zoom lens and if you are a voucher holder, you will need to present your voucher on the day. Where does the trip leave from? 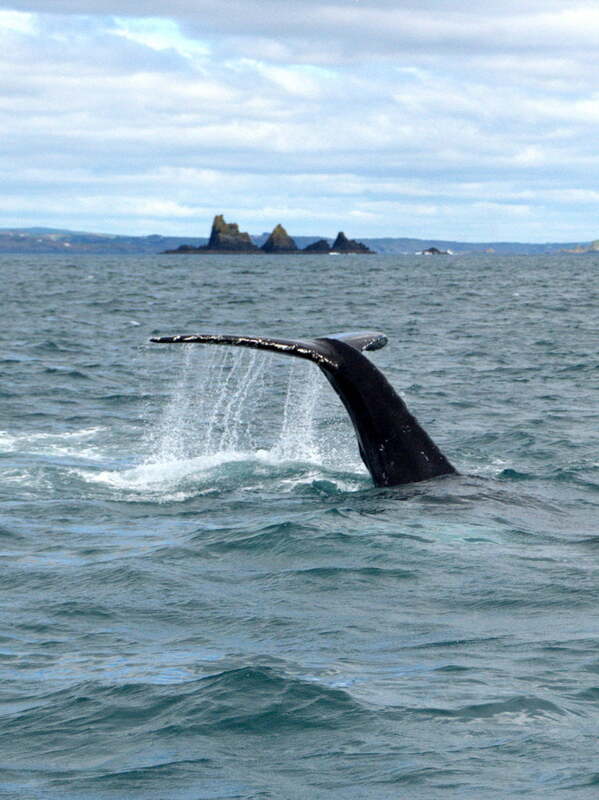 All our whale watching trips depart from Reen Pier which is 4 Kilometres outside of Union Hall village, West Cork. 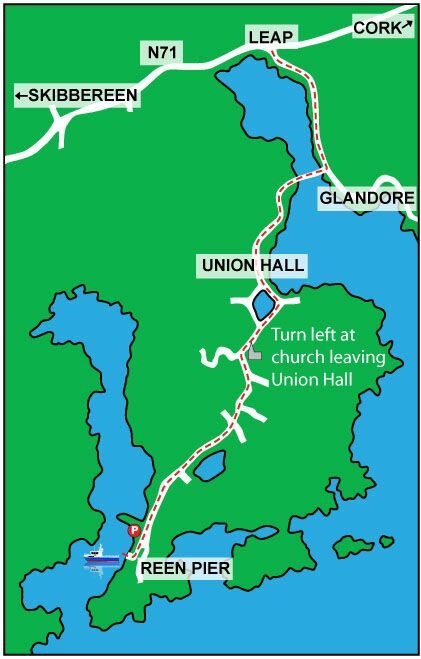 From Clonakilty, Leap or Glandore direction, go into Union Hall village and drive through the main street until you reach a large church, (St. Bridgets) on your left as you head away from village. Take a left turn at church; Reen Pier is signed at this point. Take 1st right after 300 metres (again signed for Reen Pier) and stay on this road, keeping the lake on your left, and you can’t miss Reen Pier. It’s a 4-5 minute drive from Union Hall to our car parking area. With beautiful Castlehaven Bay on your right hand side, the car parking area is marked by a “Cork Whale Watch” sign, and is about 200 mts before the pier itself; here you will find plenty of free car parking. We’d ask that you do not park on the actual pier, as it may obstruct commercial vehicles. If you are travelling from the Skibbereen or Castletownshend direction, the church is on your right side, before you get into the main village, and take a right at the church, and follow the signs as above. Our Whale watching trips are a minimum of four hours duration, but are often a longer, and typically follow the schedule outlined below. But of greater importance is the fact that we spend every minute of our time on the water searching for wildlife, which means no drop offs on nearby islands for tea and cake. When you are sitting in a cafe on Cape Clear, we are not searching for whales, and you are not seeing them! Is there wheelchair access at Reen Pier on to the Holly Jo? Reen Pier is not really suitable for wheelchair access to the ‘Holly Jo’, where access to the boat is via a ladder, and at low tide this can be a few metres drop. However, in the past we have been able to lift down wheel chair users. Castletownshend slip (on the west side of the harbour) offers suitable access at certain tide times. Colin will be able to advise on the possibility of wheelchair access depending on the tide (low or high) at the time of your trip. Any arrangements for wheelchair access will need to be made in advance when you make your booking, so please give us as much notice as possible. Where can I stay that is close to Reen Pier & Cork Whale Watch?